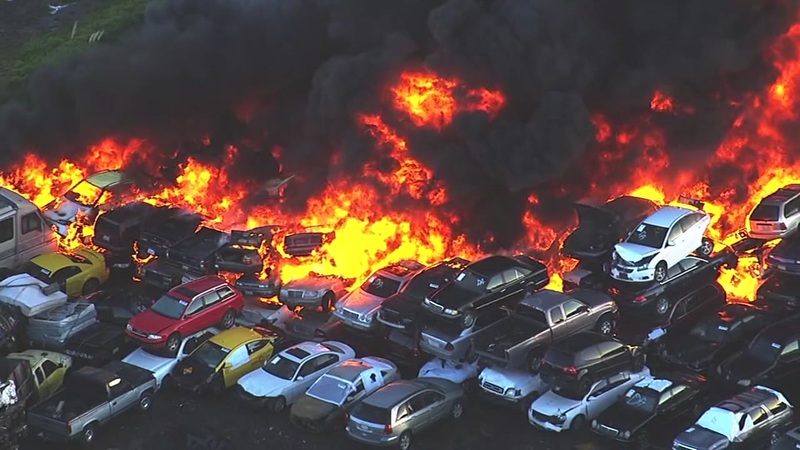 RICHMOND, Calif. (KGO) -- A fire that destroyed more than 200 cars at an auto wrecking yard in Richmond Friday may have been sparked by an electrical problem that started in one vehicle. Firefighters were called to an auto-yard at Richmond Parkway and West Gertrude Road at 7 a.m. The fire quickly spread between vehicles stacked upon one another, waking neighbors. "I was sitting in the drive when I heard a great big huge explosion, I got out of my car and I just saw billowing black smoke. I was very startled," neighbor Anita Blount said. "When you have vehicles in proximity like that, obviously there's going to be some heat transfer and that's exactly what occurred and that's probably why you heard some things," said Richmond Fire Department Chief Emon Usher. "Some pops and things like that." Crews had to use so much suppressant foam to put out the fire. The multi-agency response included crews from the nearby Chevron refinery which supplied the foam that eventually put out the flames. Teams from Contra Costa County Hazmat, Fish and Wildlife and the U.S. Environmental Protection Agency were all on scene to assess the aftermath, including potential contaminates in the smoke. Though not mandated by law, Contra Costa fire inspectors last visited the yard in March. The owner was cited for two violations, both abated by May.